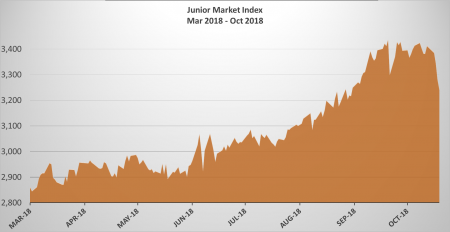 The Junior Market Index declined again on Friday, dropping 41.51 and bringing the losses since Tuesday to 171.12 points or 5 percent as the market closed the week at 3,241.74. IC bid-offer Indicator suggest that the market could bounce big on Monday. IC bid-offer Indicator| At the end of trading, the Investor’s Choice bid-offer indicator reading jumped sharply to 13 stocks ending with bids higher than their last selling prices, while 4 closed with lower offers. The market closed with 26 securities changing hands as 9 advanced, 9 declined and 8 remained unchanged, compared to Thursday with the trading of 29 securities. Investors swapped 1,069,876 units valued at $5,375,641, compared to 1,535,498 units valued at $7,110,385 on Thursday. Trading ended with an average of 41,149 units for an average of $206,755 in contrast to 66,761 units for an average of $309,147 on Thursday. The average volume and value for the month to date amounts to 83,015 units valued at $339,541 and 76,083 units valued at $349,211, previously. September, ended with an average of 484,335 at $2,628,299 for each security traded. At the close of trading, Access Financial closed at $45.50, after exchanging 126 shares, Blue Power concluded trading 30 cents higher at $6.30, with 3,000 units, CAC 2000 finished at $18, with 5,278 shares trading, Caribbean Cream dropped $1.95 and ended trading 12,577 shares to close at $4.80, Caribbean Flavours traded with a loss of 1.50 cents at $17, with 10,000 stock units. 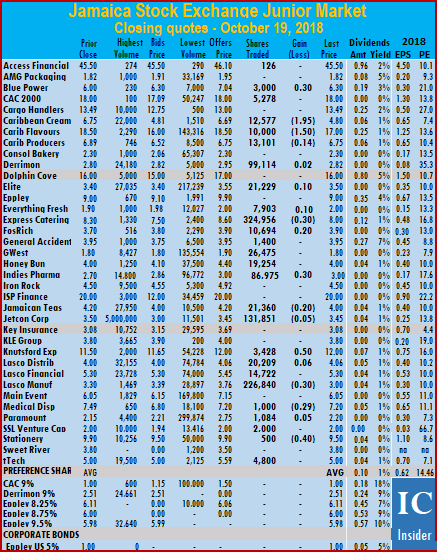 Caribbean Producers finished trading 13,101 units with a loss of 14 cents at $6.75, Derrimon Trading ended 2 cents higher at $2.82, after exchanging 99,114 shares, Elite Diagnostic finished 10 cents higher at $3.50, with 21,229 stock units changing hands, Everything Fresh gained 10 cents in trading 7,903 shares to close at $2, Express Catering ended trading with a loss of 30 cents at $8, in exchanging 324,956 shares. FosRich Group traded 10,694 shares and rose 20 cents higher to $3.90, General Accident finished trading 1,400 shares at $3.95, GWest Corporation closed at $1.80, with an exchange of 26,475 stock units, Honey Bun ended at $4, with 19,254 units changing hands. Indies Pharma rose 30 cents to end at $3 with 86,875 shares changing hands. 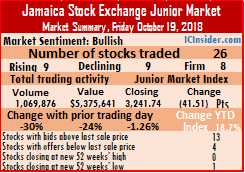 Jamaican Teas settled with a loss of 20 cents at $4, with 21,360 shares trading, Jetcon Corporation ended trading 131,851 stock units with a loss of 5 cents to end at $3.45, Knutsford Express closed 50 cents higher at $12, with 3,428 shares changing hands, Lasco Distributors ended 6 cents higher at $4.06, after exchanging 20,209 shares. Lasco Financial concluded trading 14,722 stock units to close at $5.30, Lasco Manufacturing finished with a loss of 30 cents to close at a 52 weeks’ low of $3, trading 226,840 units, Medical Disposables ended trading 1,000 shares with a loss of 29 cents at $7.20, Paramount Trading closed market activity with 1,084 shares trading to end 5 cents higher at $2.20. SSL Venture Capital traded 2,000 shares at $2, Stationery and Office finished trading 500 stock units with a loss of 40 cents to close at $9.50 and tTech ended at $5, with 4,800 shares changing hands.